The My-T-Soft® Build-A-Board Builder is the creation / design tool that allows you to create boards / panels / windows that contain keys & user-interface components, and manage your projects. This chapter outlines and describes the various aspects and features available within the Builder. The next chapter covers additional details and reference information about working with the builder and creating boards. Projects contain Source files, and build Targets - in most cases, the output Target folder also contains the run-time Program (or install files for the run-time target selected). The data file is the KeyBoard File (.KBF) - this KBF contains the run-time ready layout designed in the builder. Projects are saved in the Source folder (default [Shared Documents]\Build-A-Board\Source, e.g. \Users\Public\Documents\Build-A-Board\SOURCE). You may Build, Execute, and manage Run-time file sets from the Builder. Projects can be configured to build for a selected Target (within any limitations imposed by the run-time target selected). These are saved as sub-folders in the Project folder in the TARGET folder (default [Shared Documents]\Build-A-Board\TARGET, e.g. \Users\Public\Documents\Build-A-Board\TARGET). 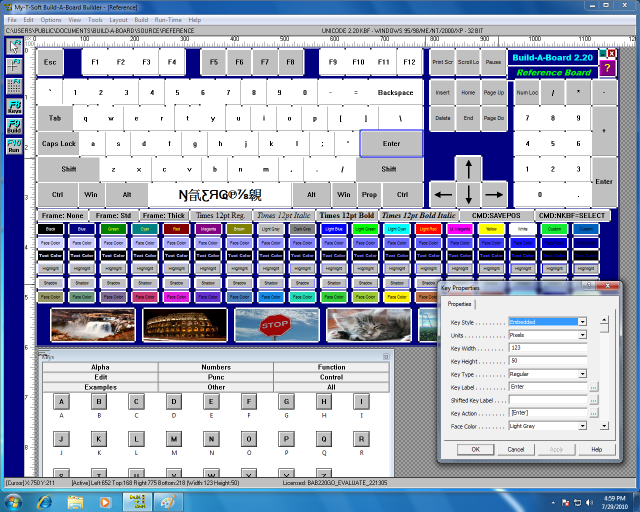 The Builder displays several optional windows, along with the main Panel Display where you can manipulate a My-T-Soft Panel - adding/deleting/modifying keys, their contents & actions. In the next chapter, detailed usage and reference material is covered.